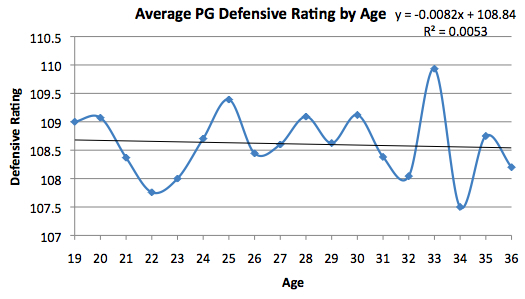 Basketball-Statistics.com » Blog Archive » Does Defense Get Better With Age? 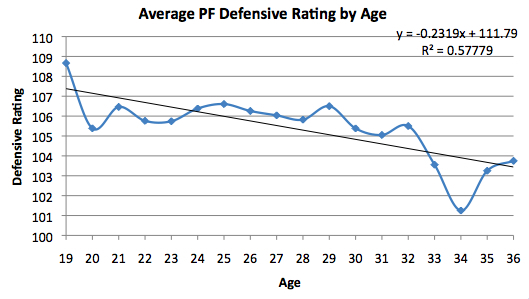 Does Defense Get Better With Age? As players get older, the belief is that they learn the tricks of the trade and get better at defense. During their first few years, they’re ill-equipped and unable to have a positive impact on defense, despite their superior athleticism and energy. I limited the age range from 19 to 36 to avoid outliers. 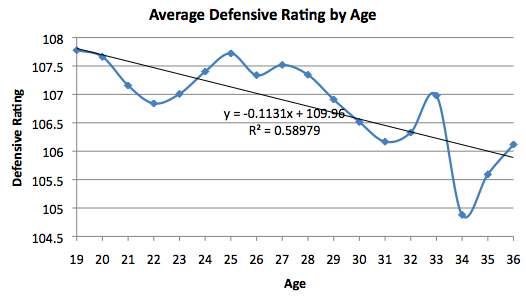 On the x-axis, we have the age, and on the y-axis, the average Defensive Rating for that age. The results seem to confirm the common belief. 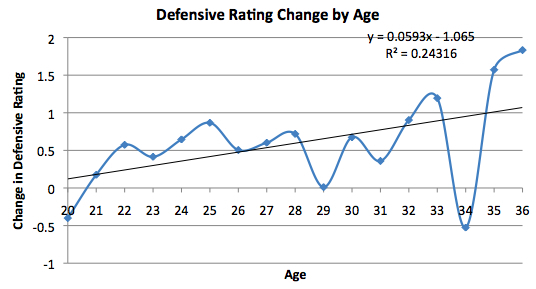 Younger players tend to post higher (worse) Defensive Ratings than older players. Real life doesn’t work perfectly, so there are some fluctuations. However, the correlation is strong, indicated by the relatively large R^2 (explanation here). 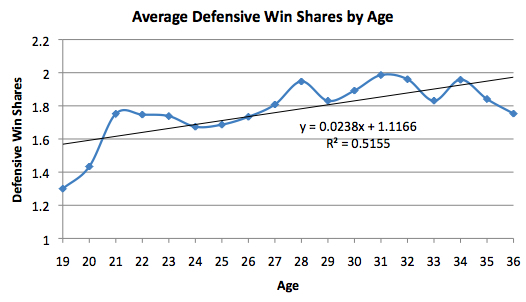 Therefore, there does appear to be something to the notion that players get better defensively as they get older. The R^2 is slightly smaller, but the general idea is the same. 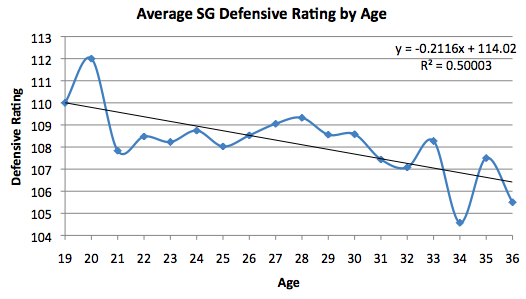 Players get better defensively as they get older. Not considerably so, but statistically significantly so. However, we must approach these results with caution. Let’s say, hypothetically, that big men generally have lower Defensive Ratings. Let’s also say, hypothetically, that big men stay in the league longer than their shorter counterparts. These two scenarios would combine to make it look like players get better defensively with age. What’s a simple way to account for complications such as this? Take a look at the data position by position. The results appear to be clear as day here. 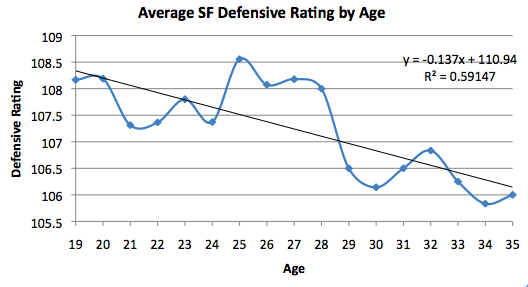 The line is a little wavy, but centers sure seem to get better defensively as they get older. The average for 35-year olds is over three points per 100 possessions lower than the averages for 19-, 20-, and 21-year olds. Do power forwards react the same way to age? Simply put, yes. These results tend to go with common logic. Many raw and young big men commit silly fouls, ignore help defense, go for the spectacular block too often, etc. However, we should not treat these results as gospel, as I will explain later. Woops. That trend line has an oh-so-slightly negative slope, but it’s not exactly a great fit for the data (the R^2 is practically 0). Clearly, then, point guards don’t follow the same path as other positions. Older is not better in this case. For a position that often relies so much on speed and quickness, this makes sense. However, even point guards in their prime (around the age of 27) don’t perform significantly better than the young ones. The statistic I used, Defensive Rating, is far from perfect. Defense is one of the hardest things to measure accurately with statistics, and this measure is no different. It is highly team-dependent. Good defenders on poor defensive teams will be underrated, and vice versa. 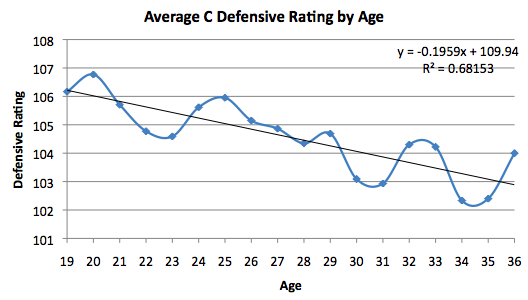 Although there is a correlation between age and Defensive Rating, that doesn’t mean it’s a causal relationship. It may not be that all older players are better defenders. Perhaps the only way to stay in the league if you’re getting older is to play solid defense, so the ones that don’t are selectively removed. Or maybe strong defensive teams like to acquire veterans, which boosts those player’s Defensive Ratings. Finally, although it is a pretty large sample-size (five years of data for 1,641 data points), the data still could be misleading. For example, if there happened to be a strong crop of old centers during the past five years, that position’s results may be inaccurate. I limited the sample to five years because I don’t like using data that is very old. The style of the NBA changes constantly, so using information from say, 10 years ago, may not be smart. Looking at the graph above, we notice a couple of things. First, over the last five years, players of all ages tend to get worse defensively on a year-by-year basis. Whether it’s because of improving offenses or declining defenses, scoring has increased during each of the last five years. More importantly for this study, we see that older players are declining faster than younger players are. For example, during the last five years, a 26 year-old is likely to have a Defensive Rating 0.5 points higher than he did a year ago. On the other hand, a 35 year-old is likely to have a Defensive Rating 1.5 points higher than he did a year ago. The difference between old and young isn’t much, but we can probably say that old isn’t definitively better than young. Like I said in my original post, selective bias may be a problem. After all, this most recent research doesn’t dispute the fact that as a whole, when you look at all the old players, they tend to be better defensively than the young players. But that’s not because they got better as they got older. The data shows this. What we may be able to say now is that aging doesn’t improve your defensive abilities, and if you want to stay in this league as a veteran, you better be good at defense, because teams will “selectively remove” you from the league if you’re not. Have you tried to look at the difference between years? This should help remove the selection bias, I think. This way we can try to make statements like “for each one year increase in age, we expect defensive rating to decrease by X points”. I’m not sure what you mean. Do you mean looking at it on a player by player basis? Sort of. You take every player and compute the difference in their performance. For example, a player’s rating goes from 115 to 113 from age 24 to age 25. You end up with a -2 for this player’s age 25. Do this for all of your players, and you end up with a bunch of rating differentials that tells you what their change was from the previous season. Then you bunch everyone up again and see what you find. Defensive rating is mostly a team measure so I’d think it would be worth checking team age, minutes weighted vs Defensive Rating. Player A is 105 at age 24 and 103 at age 25. Player B is 106 at age 24 and 109 at age 25. With my method, the average at age 24 is 105.5 and 106 at age 25, for a difference of +0.5. The other way, the difference for Player A is -2, and +3 for Player B. Average the two and you get +0.5, the same as before. I may have just picked a bad example right now and a bad example when I originally thought of it, and I may just be terrible at simple math, but isn’t it the same either way? Well lets say only the best play past some age in the 30s. Then you’re going to have a natural decline in mean drtg because they’re the best. This would help alleviate that, as you would be taking the mean of the differences instead. the smaller capital of scotland – Church aisle. And additionally on this part you manage possible various other absolutely serious medical problems. Certain that Comcast Digital Thought, I’m not against the ever have to think about each business phone bills lengthier. If you have ever had been given a souvenir widespread, you most likely see how enjoyed reading this task offered you actually seriously.